In October of 2009, I lost my “cushy corporate job” and found myself, for the first time in my adult life, without employer-sponsored health insurance. The ability to go the doctor was a non-negotiable for me, and with the cost of COBRA coverage far outside of my drastically-reduced income, it was imperative that I find a comprehensive, affordable option to address my health care needs. Over the years, I’d had conversations with friends and family members who’d utilized the services of Planned Parenthood. They sang high praises about the compassionate care they received in PPFA clinics across the country. Remembering their stories, it was a no-brainer for me. I turned to Planned Parenthood when I needed care, and I am so glad that I did. For the next 4 years, including my time as a seminary student, I received health care from a Planned Parenthood clinic on the North Side of Chicago. Planned Parenthood was my lifeline: providing me with primary and reproductive health care services. I cannot imagine what I would have done without it. I know my story is not unique. Approximately 1 in 5 women rely on Planned Parenthood for health care. Each year, Planned Parenthood serves 2.5 million people. Nearly half of Planned Parenthood’s patients are people of color, and many live in rural areas. If patients are blocked from accessing care at Planned Parenthood, many will have nowhere else to turn. As a person of faith, I believe that denying health care to people who need it directly contradicts our responsibility to care for those in need and side with the poor, marginalized, and vulnerable. But, that is precisely how many politicians would have it. Over the past several weeks, they have tried time and time again to repeal or gut the Affordable Care Act (ACA). Make no mistake. As affordable health care hangs in the balance, the most vulnerable in our population stand to lose the most in this fight. We will not stand by as politicians cherry-pick certain religious beliefs to use as political weapons. 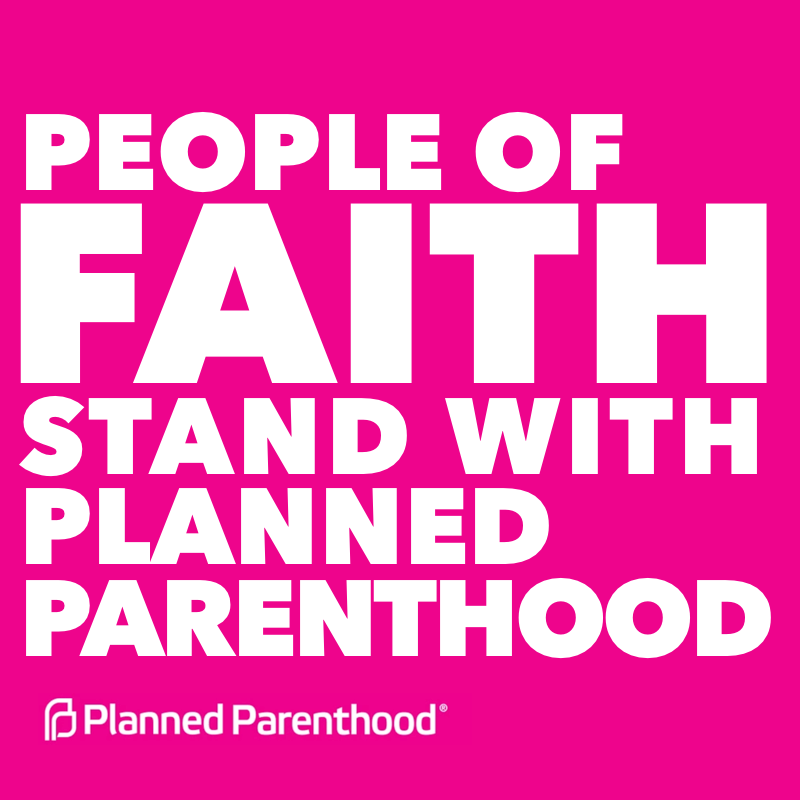 We continue to stand with Planned Parenthood because of, not in spite of our faith. We believe that, by caring for those in need and walking alongside those making important life decisions, Planned Parenthood does sacred work. We assert that access to comprehensive and affordable health care is not only a right but a moral imperative, rooted and grounded in a faith that compels us to be concerned about the care and welfare of all people. Progressive people of faith are not an emerging force or a new trend in the political landscape or the fight for reproductive health care. We have been fighting for years, and we have consistently demonstrated our commitment to Planned Parenthood. For more than fifty years, religious leaders and people of faith played a critical role in helping women get access to safe, affordable reproductive healthcare. The first 100 days of this new administration have been no exception. Hundreds of religious leaders across faith traditions have added their names to a statement organized by the Religious Institute in support of Planned Parenthood. 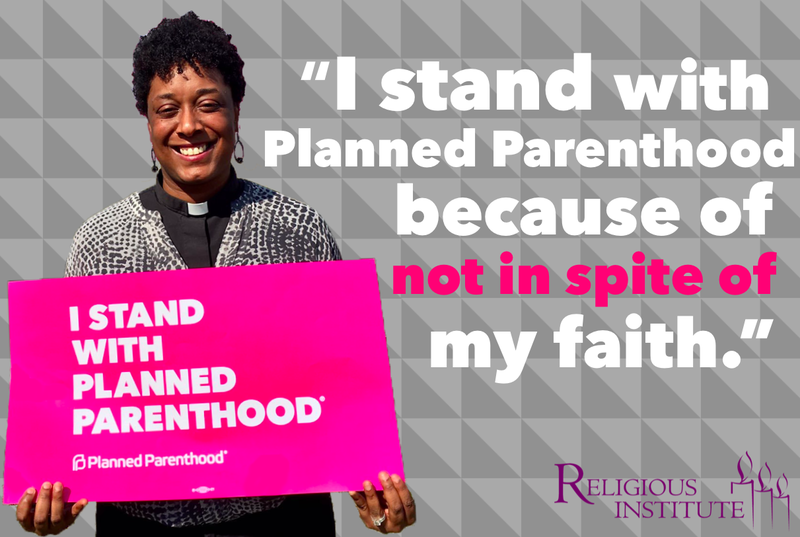 In March, PPFA, SisterReach, and the Religious Institute trained more than 40 clergy to organize their faith communities to resist attacks on reproductive health, rights, choice, and justice. The first 100 days of this administration have shown us how courageous people of faith are reclaiming the narrative about religion and reproductive health care. Under the proposed TrumpCare plan, we face the real possibility of a complete gutting of Medicaid, tighter restrictions on abortion care coverage, and the ultimate defunding of PPFA. The prospect of TrumpCare replacing the Affordable Care Act is both sobering and dangerous. As people of faith, we will not stand by and allow this to happen. We will continue to speak up and speak out loudly, deliberately, and boldly. We will not allow injustice to have the last word in the lives of the most vulnerable in our society, especially women of color, low-income people, and trans women of color. Our faith requires that we not remain silent.